The Asian-Glazed Braised Short Ribs get much of their deep, rich flavor from Chinese five-spice powder, a warm and fragrant spice blend typically composed of star anise, cloves, fennel seed, cinnamon, and Sichuan peppercorns (these aromatic, mildly fruity and peppery reddish-brown dried berries are unrelated to black or white peppercorns). Licorice root and ginger may also be components of five-spice powder. Some supermarkets carry fivespice powder—it’s part of McCormick’s Gourmet Blends collection—and you can easily find it in Asian markets. You can also grind your own from whole spices, although some of the ingredients may be just as hard to find as the blend itself. The advantage to making your own is that, like all freshly ground spices, it’ll be more potent than its preground counterpart. 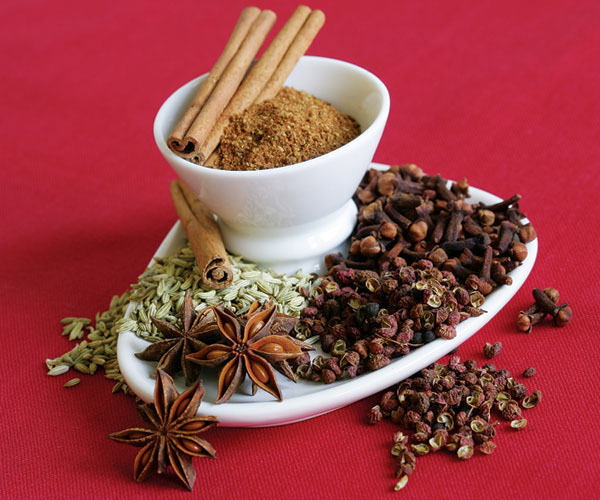 For a mail-order source for five-spice powder and its components visit Orientalpantry.com.